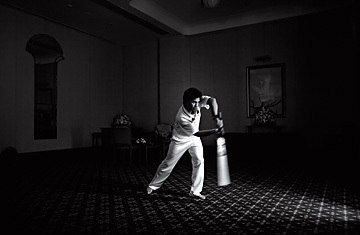 Cricket God Sachin Tendulkar, photographed in Mumbai in April 2012. Sachin Tendulkar wishes people would just get out of his head. Since March 16, when he smashed cricket's equivalent of the sound barrier by notching his 100th century--a single-innings score of 100 or more runs--for his country, the player deified by a billion Indians and revered by half a billion other cricket fans has been dogged by questions about what he would do next. Having reached a mark previously considered impossible, would he play on? Or would he walk away from the sport he has dominated for more than two decades? And if so, would he become a businessman, a TV pundit ... a performer of miracles? The incessant inquisition, carried out by Indian media that have long banked on Tendulkar's popularity to sell papers and score ratings, finally got to him on the very day of his 100th 100. "Critics haven't taught me my cricket, and they don't know what my body and mind are up to," he told the Indian magazine Open. It wasn't for them to judge when his time was up, he said; when he feels "unable to serve India, I will stand down and give it all up." It was an uncharacteristic display of pique from a player who is known as the Master Blaster for his aggressive batting style but is almost as famous for his placid demeanor off the field. No one is ever going to confuse Tendulkar, 39, for John McEnroe. By the time we meet, a month later, Tendulkar has regained his composure, but his manager has asked me not to use the R word. Retirement is not on Tendulkar's mind. In fact, he'd like to have nothing on his mind at all--no critics, no records, absolutely nothing. When he goes out to bat, Tendulkar seeks "the zone." It's a mental state familiar to great athletes in which the mind filters out the crowd, the opponents, the score and other distractions; performance is guided by a magic combination of intuition and muscle memory. Tendulkar speaks of it in terms more spiritual than sporting: "I need to surrender myself to my natural instincts," he says. "My subconscious mind knows exactly what to do. It's been trained to react for years." Tendulkar admits he hasn't yet mastered the ability to get into the zone at will, for which bowlers around the world must be grateful. He has breathing techniques, tricks to psych himself up, but even so, he makes it only "50% of the time," he says. It's a miracle he can get there at all. Of Tendulkar's many achievements as a cricketer, perhaps the most difficult is the one he must repeat every time he bats for India: carrying the hopes and dreams of an entire nation on his back. It is the heaviest burden borne by any modern sportsman, and his ability to carry it for more than 22 years while utterly dominating his sport makes a good case that Tendulkar is the world's greatest athlete. In cricket, a batsman who hits a century, or a "ton"--another term for a 100-plus-run innings--displays the most consistent measure of batting prowess. Great players end their careers with anywhere from 25 to 50 such scores. Tendulkar's ton of tons is beyond great. Every sport has record breakers, but of his contemporaries, only Michael Jordan, Lance Armstrong and prescandal Tiger Woods come anywhere close to matching him in redefining the realms of possibility. Leo Messi may be the best soccer player on the planet, but he has Cristiano Ronaldo nipping at his heels; Tendulkar leads his closest challenger, Australia's Ricky Ponting, by a staggering 29 centuries.